Very few water jurisdictions have standard details in place for an outside, above-ground-backflow preventer installation. As a result, the design industry doesn’t spend the time searching for these details, and designers won’t risk creating an outside, above-ground-design if a standard detail is not in place. So, the same design that is always approved gets designed again and again, even though it is not the safest. This blog is the second in a three-part series on the importance of well-thought-out and complete standard details for backflow prevention assemblies. In Part 1 of our series, we covered how an outdoor, above-ground backflow enclosure can save the customer money and eliminate risk. Today we’ll explain the benefits for the water jurisdiction when the backflow assemblies are installed in an above ground, aluminum enclosure. The utility vault has been an accepted design practice for the backflow preventer installation for decades. It is also the most dangerous because it’s a confined space. This is an unnecessary liability for a water jurisdiction. A backflow preventer installation in an above-ground enclosure eliminates the risk. Ask anyone who has ever tested a backflow prevention device. They will tell you 100% of the time they prefer to work above ground. In fact, for safety reasons, the Las Vegas Valley Water District is in the process of removing all backflow assemblies from vaults. They also favor reduced pressure backflow preventers for the extra protection they provide. This is done to prevent water that’s passing through the meter from returning to the distribution system, or a cross connection. But installing your backflow preventer underground increases the chance for a cross connection because underground vaults often flood. When vault fills with water, it takes a very long time for the water to evaporate. This can keep your backflow preventer submerged in dirty runoff water for months. And many of the backflow prevention assembly testers and water jurisdictions we’ve talked to say when they open the vault lid there is some level of water inside, and oftentimes the backflow device is completely underwater. 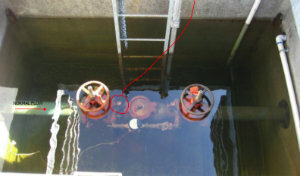 When the backflow device is underwater, the check valves are also under water. This is a problem because water jurisdictions are required to test backflow prevention assemblies annually. This is an important step in maintaining clean drinking water. Vault tests require more manpower and more expense for the water jurisdiction in the long run. If the objective is to develop and implement cross connection control programs to safeguard public drinking water systems, why does the industry continue to allow this design practice? We recognize change is hard. But the best practice for the location of the backflow prevention assembly is outside the building, above ground, and in an ASSE 1060 enclosure. Although there are many cities supporting the need for above ground standard details, it’s not nearly enough. Safe-T-Cover helps water jurisdictions improve and create a comprehensive set of standard details for above-ground enclosures every day. Contact us if we can help you with yours. You can also check out our guide: “Trends in Backflow Preventer Installation.” Inside you’ll find the latest trends about reduced pressure backflow preventers.